« Queen Elizabeth and our problem with the two flags? This entry was posted on May 23, 2011 at 10:14 pm and is filed under Advertising, Air travel, Ireland, Marketing, Uncategorized. You can follow any responses to this entry through the RSS 2.0 feed. You can leave a response, or trackback from your own site. Both airlines are aiming to sell seats – and just that SEATS to get us the consumer from one destination to another. It is a personal choice to decide if you wish to travel in comfort or safe euro, which you may not if you run into a problem with the low fare airline…….it could end up costing you another ticket! 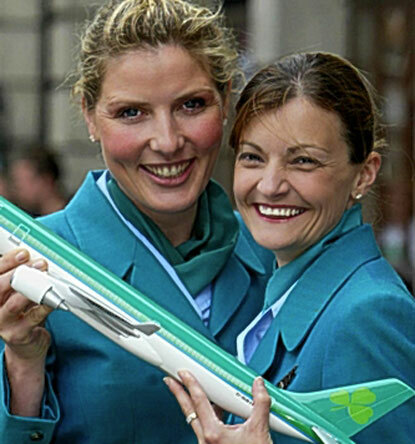 Aer Lingus have a wonderful track record – but in these times, people are looking for value too – so Aer Lingus have no choice but to compete to hold their market share – but at lest they do it with a smile on their faces! They are still our National Airline perhaps they could market a “Special Business Fare “to hold onto business travellers – or 2 fares for the price of 3! There is so much they could do if their marketing people, take their eye off the competition and see how wide open the market still is………….. and yes, go for it! Competition is good for everyone, it offers choice, and we all need choices in life! I would hate to see a world where Michael O’Leary didn’t have competition! Could not agree with you more. I only travel with Whineair when I really have to given a choice I will always travel Aer Lingus. At one stage in previous role I used to travel to the UK every week and Europe at least once a month. had the misfortune of travelling with whineair on a couple of occasions and on every occasion experienced there bad service. I am flying to Manchester tomorrow and gladly paid an additional €35 to fly with Aer Lingus , it is a small price to pay to save being abused. Bring back the nuts !! Bring back the nuts could be a campaign !! – well done Tony – lets submit it to their marketing departments .. While I normally agree with everything else you say – this time I think I couldn’t disagree more! There are no end of premium airlines out there. By the way, tongue-in-cheek – suggesting that our national airline should be smiling hostesses with peanuts and we should pay more for this is bordering on, um, I can’t say this. Sexist and Elitist anyone? Ryanair is customer focused – it gives them exactly what they want – to get from Dublin to London cheaply. It’s an air-bus. I got on the LUAS last week – I stood for 45 minutes and got from Dublin to Sandyford. I parked my car in St Stephens Green and it cost €45. The LUAS cost €4. Nobody offered me peanuts. One person smiled at me but I reported them for being a pervert. I wasn’t in anyway angry, upset nor did I feel ripped off. Actually, next time I’ll save myself 30 minutes and €50 and I’ll just drive. Actually none of that happened. I just drove. But its a good point. We all have different opinions about modes of transport. But here’s one that I feel very passionate about. Aer Lingus is an awful brand, an awful company and nothing to be proud of – in my opinion. So we’re all highly paid well-off consultants – should our elitist opinion drive “public” transportation? What about all the High potential startups that our next generation are setting up on a €50 budget – that probably constitutes €45 in VAT, PRSI, other taxes – so in reality is only €5 to the real economy – how do they fly to London or Germany? What has Ryanair done for us? Its shown us that a tiny small island on the periphery of Europe – maligned and bullied by its nearest neighbour (who resisted entry to the EU and to which we still “compensate” it for that right) – can build the worlds (or Europes) largest airline (by passenger number). you don’t do that if people truly hate your brand. What did Aer Lingus do? Well, it employed more people than Ryanair at its peak, flies less people than Zimbabwe Airlines and was rent boy for British Airlines. Spell “capitulated” and you’ll describe Aer Lingus’ relationship with BA. I’ve flown Aer Lingus, Ryanaier, SAA, BA, AF, Etihad. And I love Ryanair – its predictable, dependable and efficient. Aer Lingus takes 2 hours to board. You have to file in single line. Its dreadful. And that green – its sickening. Without Ryanair we’d be paying €900 to fly to London – not because it costs €900 but because we’d be paying for the Aer Lingus “lifestyle”. Not ours but the unionised workforce that it supports with a civil service attitude to “work” and a Rolls Royce pension scheme. Aer Lingus represents all that is wrong with Ireland Inc. Founded on De Valera Self Sufficiency Economics – its another bloated, overpaid, under efficient HSE/RTE/Ianroad Eireann/Bord Gais – there to support the people who work for it. Hmmm … interesting viewpoint – say what you mean will ya! 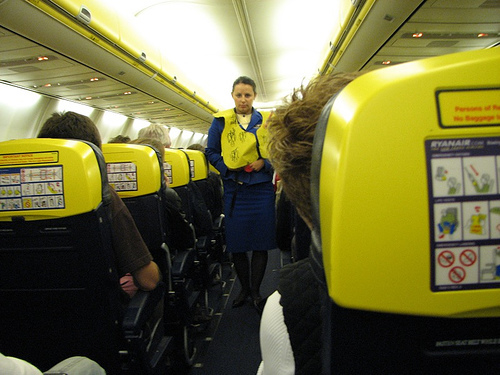 I agree with your Ryanair assessment – you get what you pay for – “lowcare”. I hate his business model, I detest his attitude and I do like to feel that even as a customer, whatever I have paid for a ticket that I am valued – to hear Mr O’Leary arguing that the regulators are being too careful about the risks of volcano ash risk summarises his attitude about his human cargo! Is he arguing because he cares or because it is costing him? A lot of people have no issue with travelling that way – with me I resent it and prefer not to go to a destination if the only way is via Ryanair. Genuinely, I wouldn’t go – I don’t want to feel like cargo! The blog is about market positioning and a business that has (had) a USP around a level of service and then ditching this somewhat to compete with a totally different beast. The “opportunity” is in the different position – I feel they have let that slide. There is no doubt there are legacy issues around pay and general “fat” practices which have to be ironed out. The revenue model is about positioning and winning enough business and without getting that right they will lose out totally. Taking on your points I see Ryanair as a being a terrible reflection of Ireland – many disagree with this view, they see Michael O’Leary as being a sort of national hero. The cocky and brash attitude displayed in court last week with Rosanna is anther tiny example. I appreciate that you have not seen people abused but I can tell you horror stories about plane cancellations, excess charges, late charges and other awful ways where they abuse their position of power, milk a miss-fortunate situation and cream revenue from passengers in other ways. As I said .. not for me! I’d prefer peanuts and a smile any day ..
It’s an interesting discussion and since reading this, Aer Lingus and Ryanair seem to be popping up all over the place. I noted that Ryanair were nominated the most Green airline in the world, leaving 1/3rd of the carbon footprint of the worst airline. I’ll be flying with Aer Lingus tomorrow, I hope they don’t let me down!! I feel so passionately about Ryanair that I would avoid a destination if they were the only option. When I was very young (before the days of strict security) my dad brought me on a tour of an airplane. The steward gave me some of the sweets they handed out to passengers during take off and landing, a packet of airline peanuts and some of the orange they gave out free as well. It made my day, I have loved the idea of going on a plane ever since. But now there are no peanuts, no sweets and no orange and having been on the bad end of Ryanair’s point to point service, I can’t agree with you more. I don’t want to save €40 to endure an endless amount of selling, upselling, over priced sandwiches, train travel to my actual destination and garish yellow plastic in my face for the duration. I’m a consumer and I vote with my feet and my wallet. I just choose not to fly with them anymore. At least Aerlingus and its staff are allowed to maintain a bit of class and some customers service. So bring back the peanuts! Let us feel like its exciting to fly and not a chore. great post Claire – I feel exactly the same way. Ban the blue and yellow plastic and the attack of your senses! !